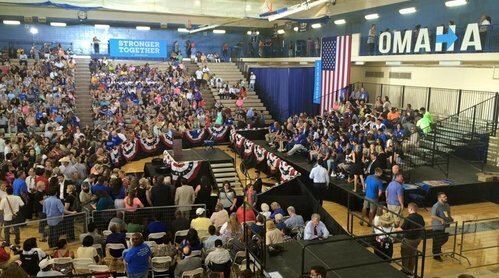 See tweets and other posts from people attending the Clinton campaign stop at Omaha North High School on Monday. Warren Buffett is to introduce Clinton shortly. 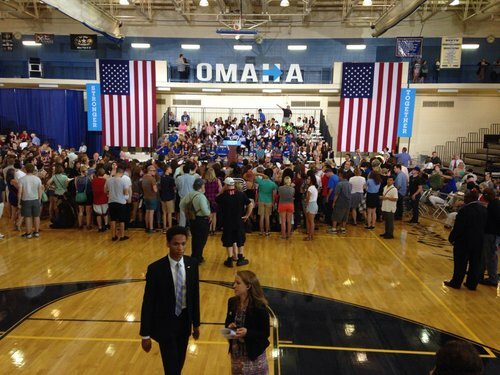 The Oracle of Omaha and @HillaryClinton are taking stage now at Omaha North. "Hillary!" Warren Buffett says, pumping his hands in the air. Buffett offers to meet Trump with each bringing their tax returns and let people ask questions about the "items on there." "You're only afraid if you've got something to be afraid about," Buffett says of Trump and his tax returns. @warrenbuffet is introducing @HillaryClinton in Omaha, his hometown. Says US doesn't distribute wealth "up to its potential." 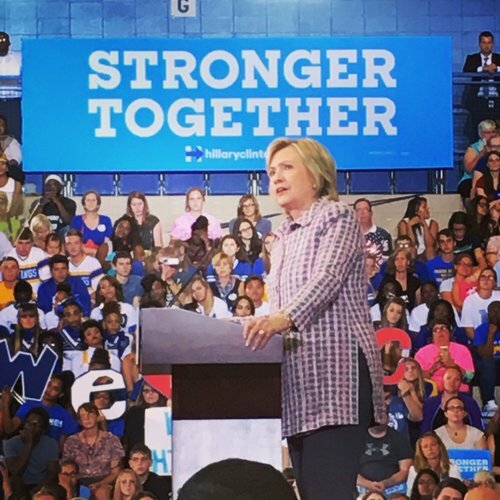 Oracle of Omaha @WarrenBuffett endorses @HillaryClinton, rebukes @realDonaldTrump about the Khans, bankruptcies. At #HillaryClinton rally in Omaha, Warren Buffett says he will "do selfies, whatever it takes" to get people to the polls on Election Day. 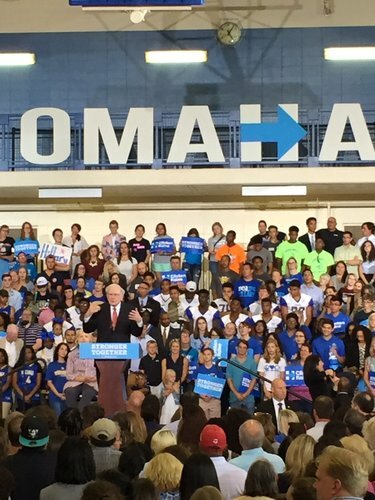 Wow, @WarrenBuffett is amazing...what a great opener for @HillaryClinton in #Omaha rally. "Change the pronoun in the constitution" indeed! 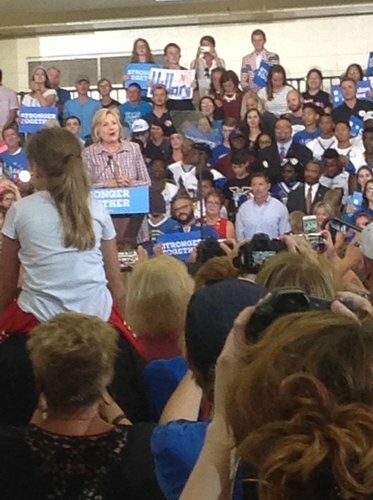 "That's just not the way we were raised," @HillaryClinton tells crowd of 3,100 in Omaha on Trump's "I Alone" speech. 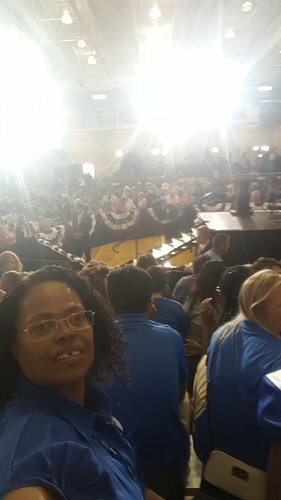 Crowd breaks into loud chants "HILLARY, HILLARY ..."
Hillary's speech in Omaha really hits the truth about America today and how Congress is paralyzed by "big money"
HRC calls the recession a "terrible" time for Omaha. She should know. 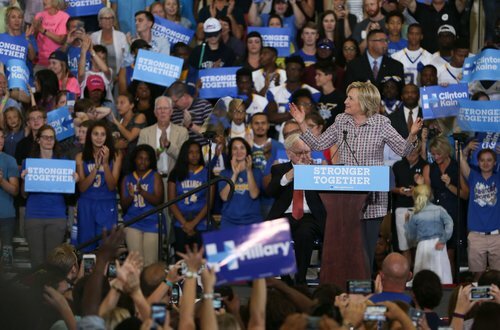 The crooked terrible Hillary caused the "terrible" recession! Every district in this country should take the Buffet Voter Challenge and see if they can increase voter turnout for Hillary. 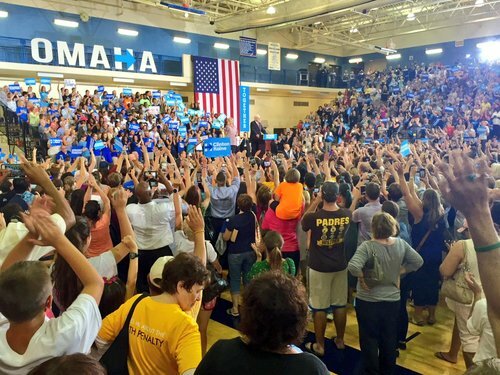 That could make a huge difference in defeating Donald Trump this fall. 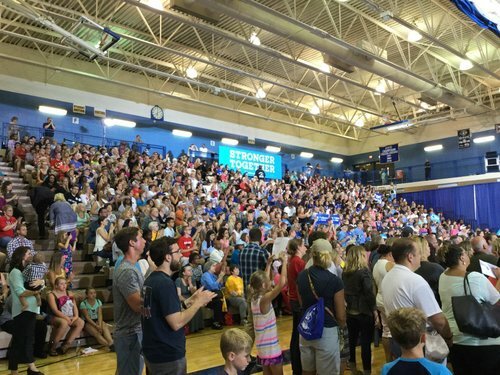 #Hillary #Omaha Love all the young people of North! 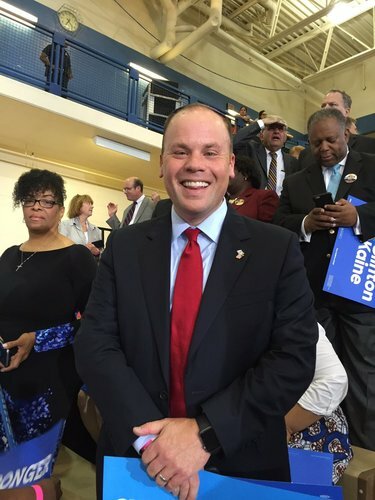 Love the diverse faces of America! 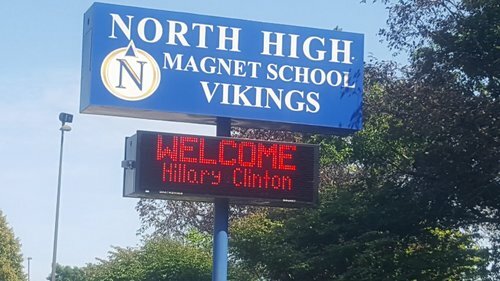 Hillary is now an honorary Viking! 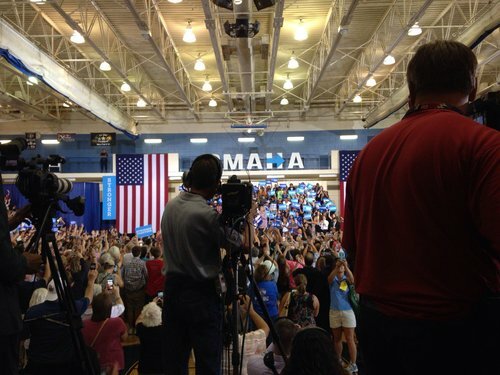 #Hillary #Omaha #Warren Buffett No teacher at North will tell students "I alone can fix it!" 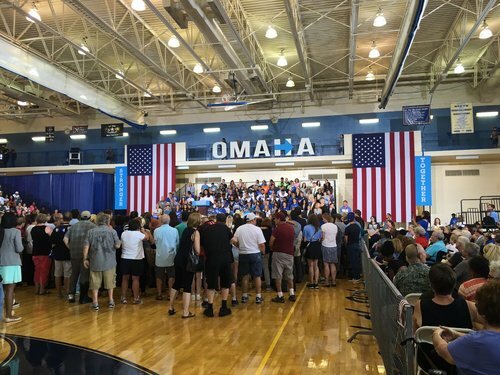 #HillaryClinton promises "boldest investment in American infrastructure since the highway system" in #Omaha. Has she heard of the potholes? 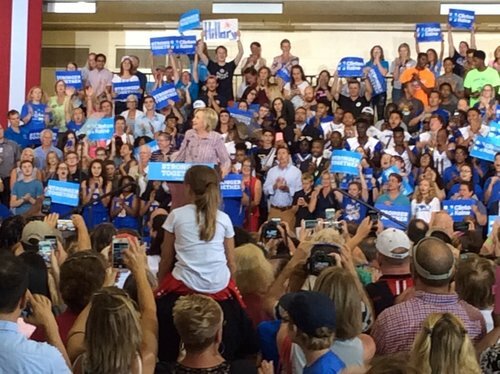 Never heard so much applause for waterways and electric grids as at @HillaryClinton Omaha rally!